NOME — Mitch Seavey just had the race of his life. The 57-year-old musher from Sterling won the Iditarod Trail Sled Dog Race at 3:40 p.m. Tuesday, shattering the speed record by nearly eight hours to steal the title of fastest Iditarod musher ever from his much-younger son, Dallas. Mitch remains the race's oldest champion and has notched three wins in 13 years, his last in 2013 at age 53. "Fifty-seven used to be old, and it's not anymore. I'm just letting you know that," Seavey said at a press conference after the race, his statement met by applause in the crowded building near the finish line. In 4-degree temperatures Tuesday, Seavey pulled under the burled arch on Nome's snowy Front Street with a team of 11 dogs, led by 4-year-old Pilot and 5-year-old Crisp. Crowds lined the street, cheering on the team and taking photographs. One person held a sign that read, "Old guys rule." Seavey, in a puffy, red parka with a thick ruff, got off his sled and walked to the front of his team, praising the sled dogs along the way. "Good dogs," he told them, icicles stuck to his mustache. "Good dogs." "I've never seen anything like this," Mitch Seavey said of his team's speed throughout the race, which started March 6, in Fairbanks, and featured a temperature swing of at least 70 degrees, with lows reaching 40 and 50 below in its early days. A month before the Iditarod began, race officials said they planned to move the official start north, from Willow to Fairbanks. The course out of Fairbanks includes more running on frozen rivers in comparison to the Willow route that sends mushers over the Alaska Range. But, Seavey said he didn't know if the course necessarily contributed to the fast race. "I'm not sure whether it's slower to go a couple hundred miles on the Yukon at 50 below or take a little hop over the Alaska Range," he said. Still, he gave the trail the grade of "A-minus." Throughout much of the 1,000-mile course, Seavey's team held its speed, allowing him to pull away from the other frontrunners. "They love speed," Seavey said of his sled dogs. "I think it frustrated them to go too slow, so I just let 'em roll. It was scary because I've never gone that far that fast ever, but that's what they wanted to do and maybe it's a new chapter." Seavey's team recorded runs that averaged 10 and 11 mph between some checkpoints and the separation he built over other racers gave him the flexibility to bank generous rest for his dogs, and himself, as they moved up the Norton Sound coast in the race's final days. "They only know one thing and that's 9.5 to 10 mph and they hit their feet, and they hit their speed and that's what they do. And they trusted me to stop them when they needed to be stopped, and feed them, and I did that, and they gave me all they could. But I guarantee they're tired now," said the new champion. Seavey attributed his speed in part to a year-round training schedule, setting their pace at 10 mph if the trail allowed it. "I hope this becomes the standard and I don't want to speak less of any of my competitors, but if we can prepare our dogs for what we're about to do, and perform in that zone, they should eat, they should be comfortable, and they should be happy all the way through. And yeah, they'll be tired. It's an athletic event. Tired at the end is what you're looking for," Seavey said. "I'm very pleased that it all played out on the big stage here." During the race, Seavey also used his sled to haul dogs, resting them in compartments the way a coach rests players on a bench. While he said it made his sled heavy and hard to manage, it probably contributed to the new speed record. His son, Dallas, also unveiled a high-tech sled this year to continue hauling sled dogs, as he'd done in previous races, months after the Iditarod banned mushers from carrying dogs in cabooselike trailers attached to the back of their sleds. "It probably contributed to the record, though I would like to try it without hauling dogs," Seavey said. On Tuesday morning, Seavey left White Mountain with a lead of more than two hours over Dallas and Girdwood musher Nicolas Petit. He expanded it to nearly three hours over the last 77 miles. His first-place finish earned him a $71,250 check and new truck, and his record time to Nome proved once again that the multiweek race of the Iditarod's early years has become more of a long-distance sprint. Seavey's time was more than 12 days faster than the winning time of the slowest Iditarod, 20 days, 15 hours in 1974 by the late Carl Huntington. He said Tuesday he didn't doubt the race could be done in less than eight days. "Part of this is about continuing to adapt and change and grow," the 2017 winner said in an Alaska Dispatch News interview last year. Seavey ran his first Iditarod at age 22, and has started 24 races total. "I feel like if you sit still, you get run over." Which may be exactly how his competitors are feeling today. Even with hundreds of miles to go in the race earlier this week, the mushers behind Seavey questioned how they would ever catch up. They never figured it out. His son, four-time champion Dallas Seavey, 30, finished in second, at 6:24 p.m. Nicolas Petit, 37, followed only five minutes behind the younger Seavey, placing third, Petit's best finish yet. Both also came in under the now former race record, set in 2016. 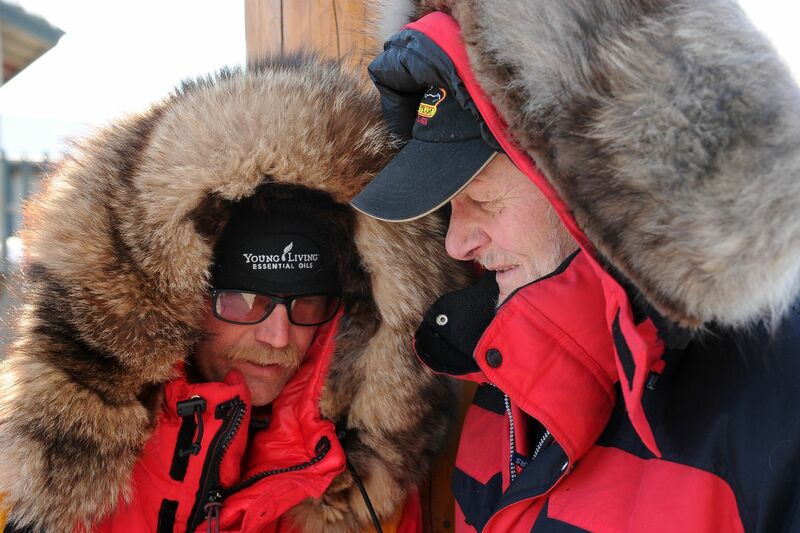 Mitch Seavey's father, 79-year-old Dan Seavey, said he watched his son's race in awe. Dan has raced five Iditarods, the first two in 1973 and '74. In the first race he placed third with a finish in 20 days, 14 hours, 35 minutes and 16 seconds. He said he never could have imagined the race would continue for so many years or become this fast. His son's performance, he said, was "nothing short of spectacular. "He's coming off Cape Nome on the Nome side over 11 mph," he said. "Back in the early days, if you were doing 6 (mph) you were coming along pretty well. So obviously, a lot has changed over the years." Correction: An estimate of the winner's prize in Tuesday's report on Mitch Seavey's Iditarod victory was incorrect. On Wednesday, race officials released prize amounts, including $71,250 for first.